Visit our online catalog and see what’s new at your local library! 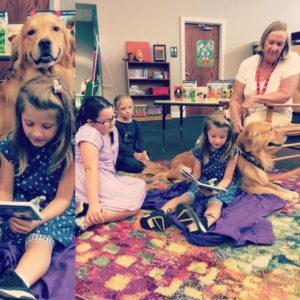 Children of all ages can sit awhile and read with Carl, a very sweet & lovable golden retriever. Carl is an Alliance of Therapy Dogs member and is trained to be a therapy dog. He loves to be petted, loved on and read to. Carl's owner, Sue (Susan Van Buren), is a registered play therapist and licensed clinical social worker who enjoys teaching families about the benefits of play therapy, what it entails, and the techniques that enhance parent/child relationships. Copyright 2019. Website Design by Papercut Interactive.